I've discovered a trick to remove that stubborn toilet bowl ring and hard-water deposits from the toilet without using harsh chemicals... and it only costs .25 cents :) We have three bathrooms in our house. Being that it's just my hubby and I, we very rarely use our third bathroom and so it sits over a month sometimes before someone even goes into it. 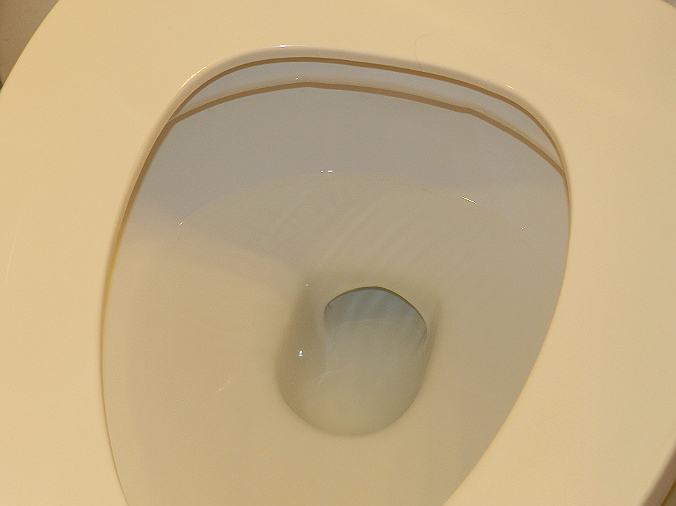 We have hard water and when the toilet just sits for long periods of time, a hard water scuzzy ring develops around the top due to lack of use. I've tried to clean it with liquid toilet bowl cleaner and with Comet but have had absolutely no luck. I didn't really want to have to buy expensive chemical cleaners then I got an idea. I've used this same method to clean the hard water and soap scum out of my dishwasher, so I figured it might work in the toilet too. My .25 cent magic easy cleaner is Lemonade Kool-Aid (unsweetened). Because of the citric acid that is in it, it breaks down the hard water deposits with very little scrubbing. 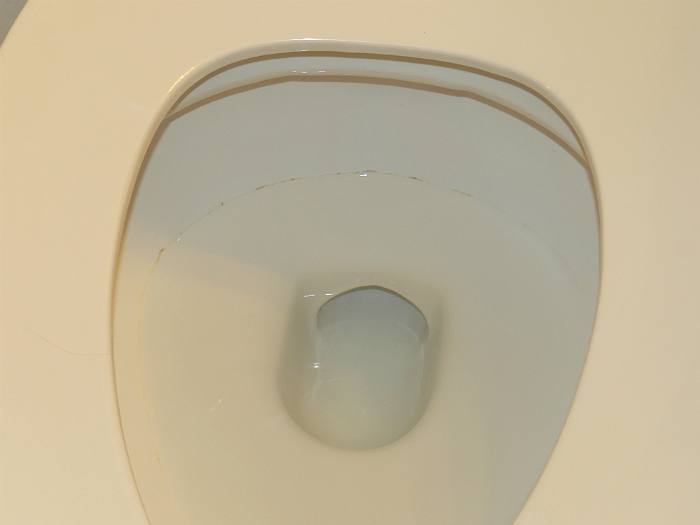 First I flushed the toilet so water would be on the side walls for the powder to stick to. I waited a minute for the water to settle and then sprinkled the Kool-aid around the edges. (It looks kinda nasty, but remember it's just lemonade). I let it sit for about an hour before taking the toilet brush to it and swishing it around to scour the sides. After basically making lemonade in the toilet, I let it sit in the toilet another hour, then one last time around with the toilet brush and I flushed. I can't believe how clean it is (next picture). I can't say that it took away 100% of the ring, but it did remove about 95% of it. 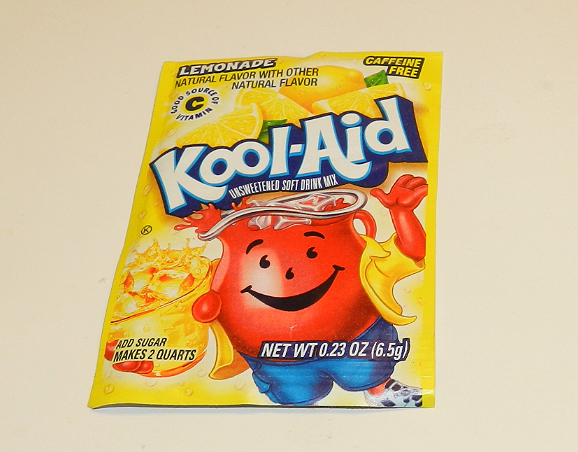 I am going to buy a few more Kool-aid Lemonade packets from my grocery store and do this one more time to remove the last of any residue. Then I will do this same process on my other two toilets :) I love that I didn't have to use any harsh smelly chemicals! I suppose this would be considered "GREEN" cleaning :) Then again, is Kool-aid friendly to the environment? Since we drink it, I hope so!!! Note: Keep in mind that the Kool-aid trick is specifically for removing the ring and hard water deposits. It does not replace a cleaning product for sanitizing the germs. No no no, do not use Kool-Aid in your cast iron skillet! It will remove the seasoning. If your pan is properly seasoned, all you need to clean it is hot water, or at most dry salt to scrub off any residue, then rinse with hot water. You can use a plastic scrubby sponge as well, but no soap. Rinse well and dry completely, coat with a little coconut oil and wipe out the pan with a paper towel. Instead of koolaide, why not use just the citric acid??? probably cause kool aid is cheaper and easier to get. What about Real Lemon juice? wonder if this would work on garbage disposals? I work at an aartment complex and its a big complaint for them to smell! Place half a small box of baking soda over the disposal then pour half a small bottle of white vinegar onto it. It will bubble-up and eventually empty entirely into the unit. It's non-toxic, too. Freeze a tray of apple cider vinegar or any vinegar or I'm guessing lemon cool aid without the sugar, pour the frozen cubes into the drian, turn on the disposer until they are all ground up, it will clean the blades and freshen the drain, you can also throw in some baking soda. Also, you can get a pumice stone at a cleaning supply store or hardware store. It works perfectly, doesn't scratch if used wet and lasts forever. pumice stone does scratch the surface of some new toilets and sinks. Yes it does ruin a toilet inside. I used it once ours and now it collects stains like crazy. I will Never ever use it again just makes you keep on using it and finally ruins the finish on inside. BIG MISTAKE!!!!!!!!!!!!!!. I agree, it scratches. I don't know how they can get away with saying it doesn't scratch - you just don't notice it right away. Now I'm trying to figure out how to repair the scratches! let it sit in toilet over night? Someone on Hometalk mentioned just dropping an Alka Seltzer into the toilet works too... and then I heard that denture cleaner also works well. Hmmm..
FOr the dishwasher - use Tang - the orange juice powder for both also. White distiller vinegar cleans and removes hard water spots. I use white vinegar. It does a great job, and does not cost $0.25 cents each time. I also use it to remove the hard water spots in my tub. If the stains are really stubborn, take a deep margarine type bowl, and mix baking soda with the vinegar. It is safe to do, but will foam up. After the foaming settles, stir the mixture to make a paste, and use a nonstick sponge to scrub your tub with the mixture. It works great! White vinegar is also a great general cleaner, and wonderful to use in a house with pets or children or in a house where people go barefoot a lot. In this way, no one is absorbing harmful chemicals into their body. You are absolutely on track with Baking Soda/Vinegar Paste! It's what Kohler tech support suggested for stubborn dirt removal on the bottom of the tub. Note: I would not use this for the sides of the tub nor the shower walls...just the bottom. great product for the dishwasher is lemishine. I live in florida and the water here stains everything. I had stopped using the dishwasher because the glasses came out so cloudy and I'd have to clean them with limeaway. one load in the washer with lemishine and the problem was over. Kept me from replacing my dishwasher. miracle product! clean your coffeemaker once a month with white vinegar. just run about half a pot through the machine and when done, run through with plain water. discard liquid between. Wow, great tip! Adding this to my grocery list now! I found this post on Hometalk. Now following you through linky followers! If Kool aid is this strong...can you imagine what it does to your kids insides? It's citric acid, vitamin C. Just like the supplement you take when you have cold. Orange Juice, and the like. No biggie. Don't make it more than it really is. Citric acid is not vitamin C! that's what i was thinking. We probably shouldn't be drinking kool aid. Wonder what it does to our kids teeth if it can clean the toilet bowl? Unless you are letting your kids paint it on to their teeth, it's no worse than any citrus type candy. Enamel on the teeth is a bit harder than hard water deposits, but if you do let you kids drink sugary drinks, just make sure they drink some water to help wash it away. I do not see any difference in the after picture at all. What am I missing? Can't see no difference as well.. Possibly you can't see as well in your montior/screen. The before toilet photo clearly shows a dark scuzzy ring at the waters edge... The after toilet photo the ring is gone! What about shower doors? Does anyone have any tips for cleaning soap scum off of my shower doors? They are clear glass and are constantly white. Thanks. For our shower doors we found the best cleaner for soap scum is called KABOOM you find it with the cleaners & sprays In the supermarket. The results was excellent. A 5 cent piece of sandpaper will restore the bowl to new condition in 2 minutes without a single scratch. To get the kool aid more directly and evenly on the hard water stain without as much of it going into the water, use an old blush brush. 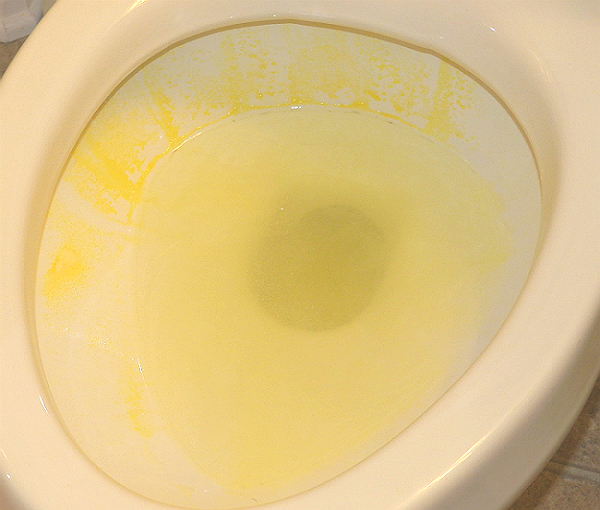 Dip the dry brush into the powder and tap it on the rim of the toilet aiming it at the stain. I think it works a little better than trying to sprinkle it from the packet. That sounds so easy. I'm going to try it tomorrow! I read about using an efferdent tablet. That was the best cleaner for toilet, tub, etc. for hard water stains.